The Hummingbirds are Here | Game Warden Field Notes | Release the Kraken! 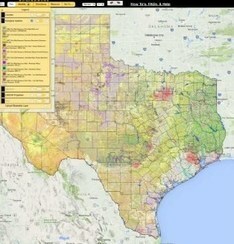 | A New Interactive Texas Map | More! Texas has 18 species of hummingbirds, the most of any state. At this time of year, even more are migrating through on their way south. They’re the smallest bird in the world, but don’t let their size or beauty fool you, many hummers are surprisingly scrappy with each other. Watch their feisty show in this live cam feed. The Great Texas Wildlife Trails have some of the best places to view these unique birds. Tens of thousands of ruby-throats can be seen passing through the Aransas Loop during migration, and other types of hummingbirds can be seen at sites along many other trails. Hummers are nectar-eaters. To attract them to your home, plant some of their favorite flowers or hang a feeder filled with sugar water. Once they find a food source, they’ll come back every year and may even visit it year-round. Pollinator conservation needs private landowner involvement to succeed. Even if you have a tiny yard, you can help butterflies and bees survive by growing a small garden of native flowers. We have developed management guidelines to help landowners protect insect pollinators. By applying just some of the protocols, you may even qualify for tax incentives. That’s a win-win! Everyone can help out pollinators by taking part in the Texas Pollinator BioBlitz, Oct. 7 – 16. Sign up to receive daily challenges, then look for pollinators and share your findings with hashtag #savethepollinators. You’ve probably heard of European honeybees, but did you know there are over 700 types of native bees in Texas? These include bumble bees, sweat bees and mason bees. They’re extremely important because they pollinate our native plants, as well as our food crops. Most of these natives are known as solitary bees because they don’t live together in hives. This is a big benefit for us, because not having to defend a hive means it’s very unlikely they’ll sting. They’re so mellow, folks add bee condos to their gardens to encourage them to live and work there as pollinators. 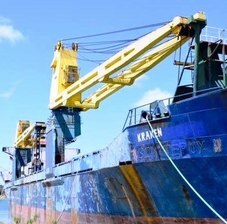 Former cargo ship, Kraken, is being cleaned before we sink her. Why? Because she’s about to begin a new life as an artificial reef off the coast of Galveston! Our Artificial Reef Program has more exciting new projects lined up, and you can learn about them as they unfold by following the program on Facebook. If you’d like to get a taste of what a sinking is like, check out this video of the sinking of the Kinta, another vessel re-purposed as an artificial reef. It’s now home to a bounty of marine life, which makes for better fishing and diving experiences in the Gulf. A gorgeous Texas landscape doesn’t just happen. It takes years of hard work and careful management. 95% of Texas land is privately held, making the work of landowners vital to conservation of our land, wildlife and water resources. We salute Blue Mountain Peak Ranch, recipient of the 2016 Leopold Award, and all the other 2016 Lone Star Land Steward Award winners. The outstanding stewardship of their land is has given us all a better Texas. Each year we partner with Texas Parks and Wildlife Foundation and sponsors like Sand County Foundation and Toyota to reward remarkable conservation work by landowners at the Lone Star Land Steward awards. We encourage you to nominate a deserving landowner. If you are interested in Texas landscape ecology, check out the new Texas Ecosystem Analytical Mapper. Created by the Landscape Ecology Program, this map contains immense amounts of new data, making it the most accurate and comprehensive vegetation map of Texas. You can use this interactive tool to view landscape related data like soils, geology, hydrology and ecosystems. Or employ it to create custom habitat reports, field guides, maps, and to calculate acres of vegetation. Try out this helpful tool for land and habitat management. From chasing cobras to chasing 5,100 pounds of marijuana, this month’s Game Warden Field Notes are chock-full of the latest adventures of Texas Game Wardens. 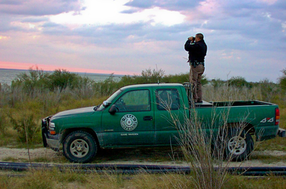 If you have a question for our Game Wardens, you can ask it through the “Ask a Game Warden” outreach. They’ll answer via the Passport to Texas Twitter account. Think of a good question and let us hear from you! If you have questions or problems with the subscription service, please contact subscriberhelp.govdelivery.com. All other inquiries can be directed to webcomments@tpwd.texas.gov. This email was sent by Texas Parks and Wildlife Department using GovDelivery, the contracted email service provider of the Department.